Having spent nearly three years looking for their ideal property, Julie and Tony Moore were instantly captivated when they drove down a secluded leafy lane to view a charming barn conversion. ‘We were on the lookout for a historic property in a rural setting, and going by first impressions, the barn and its breathtaking location in the High Weald of Kent seemed perfect,’ says Julie. Previously, the Moores had restricted their house choices based on the proximity to their children’s schools, but with the children having left home, the couple had far more freedom to widen their search and seek out a property in an area they loved. Despite their reservations about the quality of the workmanship, after only one viewing the couple knew they wanted to make the barn conversion their home. They both agreed that with a lot of care and attention they could enhance the property and transform it into a striking home. 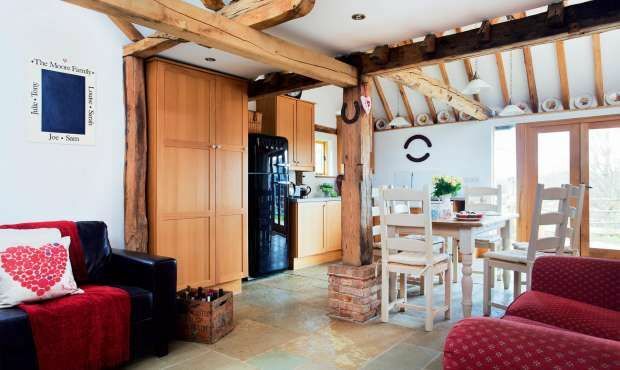 ‘It was as if the previous owners had just done the basics when they converted the barn in 2006. We felt that it needed much more TLC to bring it up to the standard such a potentially fabulous property really deserved,’ adds Julie. Having bought the barn in October 2010, the Moores went through the house from top to bottom, deciding whether beams needed to be totally replaced or simply sanded and oiled, how to set about partitioning the first floor to create two separate bedrooms, and considering the best way to introduce design touches to suit their own personal style. Dean had done such an impressive job of replacing the large oak steps leading to the back door and down into the kitchen that Julie knew he was the ideal person to help with this more involved task, as well as the many others around the property that required a skilled carpenter. Dean took up the floorboards, laid the new upstairs floor structure, then laid the original floorboards back on top of this. He then partitioned the space to create a separate master bedroom and guest room. To keep their airy new home light and bright, the Moores decided to install double-glazed internal windows with oak frames either side of the elegant vaulted landing. The open space above was filled in with plasterboard, insulated, painted, and reclaimed oak beams were added as a feature. A false beam the length of the master bedroom was also fitted in order to disguise a metal tie brace. ‘We decided to replace the old pine door to the bathroom with a smart oak one and then bought two more matching oak doors for the new upstairs bedrooms to give a more cohesive look,’ Julie says. Julie was keen to save the £1,500 she had been quoted to have the whole house treated, so wearing a boiler suit, mask and gloves, she set to work covering the affected areas in special wood preservative. ‘Treating the house with a syrupy green liquid hadn’t been on my to-do list when we moved in, but it had to be done,’ she recalls. With the major jobs tackled and the woodworm treated, Julie decided to turn her attention to decorating. ‘The whole house needed a fresh coat of paint both inside and out and, after my success with the woodworm, I reckoned I could handle this job, too,’ she says, smiling.